Singapore Shiok in Eating World, Chinatown, does Hainanese Chicken rice that takes me straight back to Singapore, and Miss Chicken falls in love with Har Mee. We like it so much we come back the next day for Char Kway Tiao and Nasi Lemak. Off to Eating World food court for a Singaporean feast, we have Tiger Beer to match. Oddly I don't like drinking Tiger in Singapore, I find the beer too heavy and filling for the hot humid weather, but it's lovely in winter in Sydney. Likewise this Har Mee is wonderful winter food from the tropics. Miss Chicken is absolutely over the moon about this dish, a 'food moment' she calls it. The broth is distinctively 'prawny' - if you have ever made stock from prawn heads and shells you will know the flavour, we love it but it could be a bit much for some folks. A mixture of thick and thin noodles make for a surprisingly lovely texture. Har Mee is a new old favourite. $10.50. I've had Hainanese Chicken Rice cravings all week, I can't believe I'm finally here, this is exactly what I wanted. It comes with a lovely broth, nice and 'chickeny'. The chilli sauce is served with a dollop of fresh ginger in the middle, and lovely black gooey sweet kecap manis, sweet Indonesian sauce, another guilty favourite of mine. This is just how I remember Hainanese Chicken Rice from Singapore: lovely, clean, lightly flavoured steamed chicken with rice cooked in the chicken stock. If you're chicken-rice inclined then you must give this a try. $8.80. Happy. We enjoy our feed at Singapore Shiok! so much we came back the next day for lunch a little more than twelve hours later. Miss Chicken opts for the Char Kway Tiao, one of her old favourites: stir fried flat noodles with squid, pork belly croutons, chinese sausage, fish cake, kangkong and chicken. The mix of ingredients work well, Miss Chicken suggests it doesn't have that 'breath of the wok' smokiness which Char Kway Tao sometimes has, but it is delicious all the same. $8.80. Excellent value. The dish comes with a small mound of sambal which is divine: spicy but not blow-your-head-off-chilli-hot. I go for my old favourite: nasi lemak. This Singapore Shiok version of nasi lemak comes with some very tasty fried chicken, dried anchovies (though no peanuts), sambal, egg in omelette form on top of coconut rice. The dude-in-charge also gives me some sweet pickled chilis which are like Mexican jalapenos, delicious. The thing I love about nasi lemak is that it is always different, I have never had two the same even in Malayisa. This one is a winner and excellent value at $8.80. 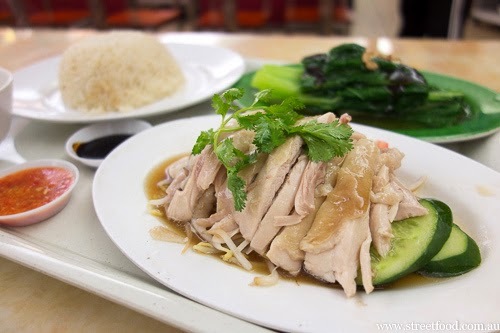 Hainanese Chicken Rice is number one on the menu, with good reason. I'm sure there's more good chicken rice in Sydney but this is the best I have found. A brief menu is a good menu, that Nasi Lemak has my name on it. Click to enlarge. A quick visit to Singapore Shiok in the Eating World food court, Chinatown for har mee. Lately we've been obsessed with har mee - Malaysian prawn noodle soup. We've been eating har mee all over Sydney and all have been compared to our favourite at Singapore Shiok, an unassuming hawker stall in the Eating World food court in Chinatown. After so many har mees I'm compelled to go back to Singapore Shiok to try it once more to make sure it's greatness isn't all in my head, that my selective memory and taste buds weren't conspiring against me. One mouthful of and I know I'm sane, partly at least. I just love the broth here: it tastes fresh and homemade, in other places the broth tastes like it is padded out with stock powder. Our theory is that since Singapore Shiok only has around twelve items on the menu they can afford to put plenty of time and care into their prawn broth. And it's not just the broth we love: the roast pork belly is divine, the lardy pork croutons are sinful and the prawns are fresh and juicy. This is best har mee we have tried in Sydney, runner up is Temasek in Parramatta. Lots of folks recommend the har mee at Hunter Street but we are Singapore Shiok pimps all the way. It's all a matter of taste, we recommend trying them all. Hokkein Mee - egg and rice noodles simmered in rich stock with generous toppings of prawns, squid & porkbelly. Served with sambal and lemon. $9.50. This is one of these dishes I saw on menus everywhere in my travels in Singapore and Malaysia and never got around to trying it, I won't be making that mistake again! Hor Fun - Flat rice noodles expertly fried with distinctive fragrance and smokey flavour. Coated with a thick savoury gravy. $9.50 (with chicken, $1 extra for seafood). We try this dish in honour of my father, Doris (long story). On the first bite the words 'oh my god' slip out of my mouth. The noodles really were expertly fried with a gorgeous smokey 'breath of the wok' flavour, like a really good char kway tiao. The thick, shiny gravy turned this into homely comfort food. It's very filling and the serving is huge. Nasi Goreng - Spicy fried rice infused with spices with a fried egg, chicken, prawns and vegetables. $8.80. You can never go wrong with nasi goreng, the picture doesn't show how big the serving is, it's huge. We've ordered way to much food, it's doggy bag time. A quick visit on a Friday night, man the har mee is still as good as ever. A rich, dark, prawnie broth with plenty of fixin's including the lovely little pieces of fried lardy pork bits that add so much flavour. Yum. Mee goreng seafood. Stir fried Hokkein noodles in a sweet sauce. Yay. We tried roasted chicken rice for the first time in Singapore a couple of months age, we fell in love with the stuff. It has a similar texture to the regular poached Hainanese chicken rice but with a bit more flavour oomph. It's awesome. The roast chicken rice set $11.30 set is Mr Shawn's favourite feed in Chinatown, it's regular chicken rice plus a serve of veggies. The rice is a little lardy from being cooked in chicken stock, but otherwise it's a pretty healthy feed. The Hainan chicken rice $11.30 set is still Mr Shawn's favourite in town, at least for nostalgia's sake anyway. The menu has change a little in the last couple of years, and we're reckon there's been at least one ownership or management change, we never see the guys that were here first. But the food is still top notch and in Mr Shawn's top five Sydney feeding holes. Singapore Shiok! is in the Eating World food court, 25-29 Dixon Street, Chinatown, at the top of the mall. Open daily 10am-10pm. super big fan of chicken rice too. recommend you to try it at "Laksa Express" in Town Hall food court. For $8.50, its the greatest deal you can find in City! I went back last week and the steamed chicken has improved on when they first started, it usually goes the other way with restaurants, it's the closest I've had to Singapore, but it's never quite the same is it? I know what you mean bat the standards. I am glad to see them getting more acknowledgment from the food blogs. I want to make sure I can at least have a decent fix for Singaporean food when I am back in Sydney. There are lots of Malaysian restaurants but not many Singaporean ones. There is a difference in food from the 2 countries and a source of endless bickering between us as to the origins of the food etc. I hope they get the Bak ku teh going...it would be such a good dish to have in winter. Now if only I can find decent mee Siam, epok epok (curry puffs), popiah, Bak chore mee, Nasi bryani, carrot cake...oh the list is endless... Hahaha. one can only wish. Ah well, til I go home again in December then. sooo many visits haha! good to see most of the dishes reviewed here. loved the food when i was in Singapore so need to try this place very soon especially for a cheap feed.